The Olympus Roamer 8x21 DPC I binoculars are made for people that want a general purpose binoculars for traveling, sport events, bird watching and to give to kids as a gift. But in the same time don’t want to spend a lot of money for a high priced model. This Olympus Roamer 8x21 DPC I comes under the $50 range and are very affordable binoculars. The low budget binoculars usually sacrifice quality for the lower price tag, and that is something that is not avoidable. There is never going to be the same brightness and sharpness of image comparing to the more expensive models, but this models is performing good if you dont find yourself in to much low light condition. 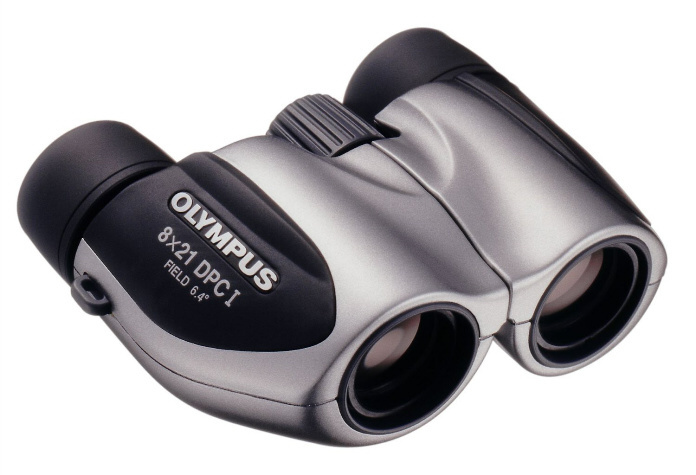 Check the price of Olympus 118705 Roamer 8x21 DPC I Binocular (Silver) here. Olympus Roamer 8x21 DPC I is light weight and can easily be carried in a pocket or a backpack when hiking or walking in a forest. Its weight is only 5.9 ounces and because of that is one of the lightest binoculars. This model features a BK-7 porro Prims, BK-7 is a borosilicate glass and is standard in many models of binoculars. Porro prism binoculars cost less and will deliver good quality optics for the dollar, but often lack durability and compact styling of the roof prism binoculars. Many porro prism binoculars don’t come with a waterproof feature. This model comes with a build-in dioptric correction that you can easily setup to compensate for differences in your eyes vision. There is 8x magnification with a objective lens width of 21mm, with above average image clarity. Olympus Roamer 8x21 DPC I is made for distance and close up viewing, unlike some models that are build just for distance, this model can be used to focus on objects as near as 7.2 feet. This models comes with anti-reflective lens coating, this coating reduces glare and provides more light to enter the lens. Higher prices models have multiple level coating that give much better results than this model. This models comes with just basic level of anti-reflecting layer and cannot be compared to higher quality binoculars, but will give average results. The housing is made of plastic, and will not come with a rubber coating like more expensive models, that makes it less resistible to bumps and scratches. So you must be careful not to drop the binoculars. Luckily there is a neck strap provided for added security and a case. This binocular is not heavy and will easily hang around your neck. If you don’t mind the plastic this binoculars look fine, just as others in the same price range. It is easy to hold and focus even with one hand. This binoculars are good for people that don’t want expensive models and are just looking for a pair of general purpose binoculars to use while traveling and outdoors that are affordable. This model cannot be compared in quality to the better models that will always provide sharper image and beter low light conditions. But in this price range this binoculars will give a nice piece that you can bring to sport events, concerts, and bird watching. Birdwatchers will be pleased with these binoculars as long as there is good light provided, in low level conditions it will not perform as well. It is good for children and women as it can fit in a purse easily, its lightweight doesn’t add to the load you already caring. Campers will be pleased with this model as it can be stored in a backpack with no problem, it is carry-around-friendly piece. In sum, the Olympus Roamer 8x21 DPC I provides a good viewing experience at a very competitive price. It is a good gift binoculars. The dioptric adjustment is a welcome extra.